At the last book club meeting, it came up that I write a food blog. We got to talking about different things that we like to cook, and Gosia, one of our Polish members suggested getting together to so some cooking. 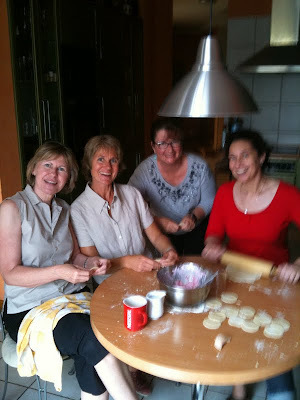 Yesterday, Gosia hosted the foreigners (a Swede and two Americans) from our group in her home. We spent the day in her kitchen making traditional Polish dishes – chlodnik (a cold beet soup) and pierogi with two different fillings. We made pierogi ruski with a potato, onion, and cheese filling; they were served with a diced smoked bacon garnish. We also made słodki (sweet) pierogi. They were filled with finely diced fresh strawberries, vanilla sugar, and cheese and topped with sour cream. Making pierogi is very labor intensive. I imagine it being done by an extended family for special holidays – much like tamales are in Arizona. That’s why it seemed like such a gift for Gosia to open up her home and spend the day with us taking on this big project. The afternoon ended with a wonderful Polish meal in Gosia’s beautiful garden. The recipes for chlodnik and pierogi will be on my food blog soon, and I’m sure Gosia’s cherry tree will be on my photo blog. I wondered if there were cooks like your mom and grandma, for whom making pierogi was no big deal.